This is the story of a crime, not a mystery in the whodunit style, but a mystery nonetheless as to why and how it happened. 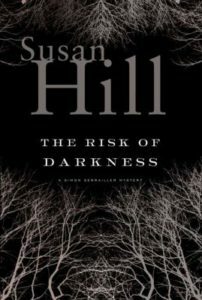 In addition, Susan Hill allows new characters to walk onto the scene and the reader wonders who is this person and how do they fit into the story. As the title suggests, this is a dark tale of child abduction and crazed grief with the thought patterns of those involved clearly laid out by the author. As Ruth Rendell said, The Risk of Darkness is “a stunning tale.” Old friends of Detective Simon Serrailler and his triplet sister Doctor Cat will welcome their interplay throughout the story. Book 3 of this series (set in England).